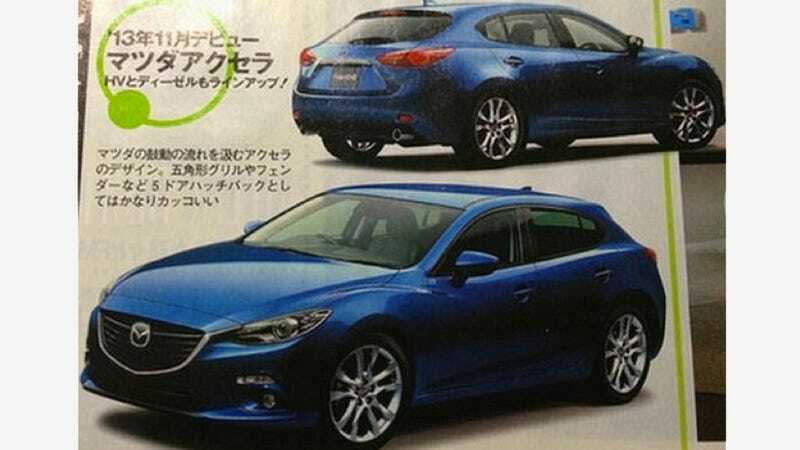 What appear to be the first photos of the 2014 Mazda3 have shown up in a Japanese magazine. If these scans are accurate, the next car will have a lot less in the way of smiles — but hopefully it will still give its driver some grins. Yes, the Mazda3, or "Axela" in Japan, seems to trade its infamous smiley face for a shrunken-down version of the styling cues from the new Mazda6. But that's not necessarily a bad thing, as the 6 is a pretty good looking car. If these photos are the real deal, it will likely be the most grown-up looking 3 we've seen yet. I'm willing to bet these shots are pretty close to reality. It certainly looks like all the camo'd up spy shots we've seen everywhere else. My main hope is that it will still be fun to drive. The Mazda3 is my favorite in this segment. Even though it's just a front-wheel-drive economy car, its impressive handling and fun character make it something I always enjoy. Any thoughts on the new Mazda3? Will you miss that smiley face?